Shiny silk. Brilliant colours. Exotic tribes and traditions. Malaysia offers a sensory feast for those who are passionate about art and culture. Your journey here will uncover a storied trail of contemporary, oriental and traditional textiles and art – a fascinating melting pot of different races from all over Asia. 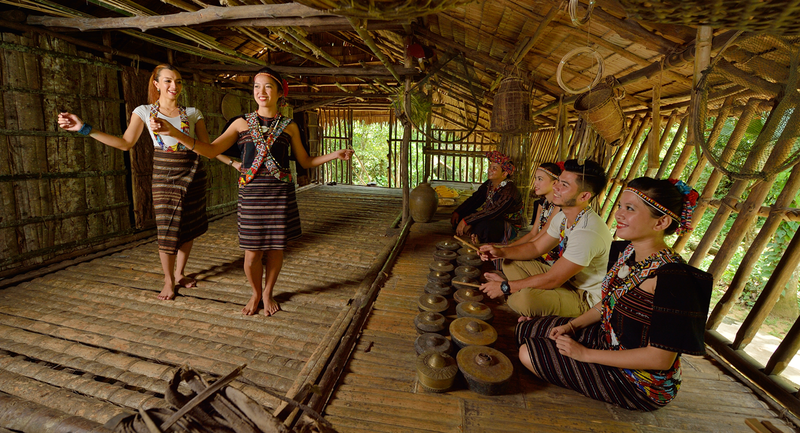 The Borneo Experience | Stay overnight in a longhouse and experience the community lifestyle. Experience Malaysia in a different light when you visit our Royal Selangor’s School of Hard Knocks and bring home a memorandum unlike any other. If you’re not into knocking metal, try your hand at painting batik at the Kuala Lumpur Craft Complex in the very heart of the city. Daily activities and workshops are held daily to exhibit authentic Malaysian artistry and craftsmanship. The comedy community in Malaysia has seen an outburst of insensible individuals proving Malaysian chaps have funny bones. Putting Malaysia on the map, Harith Iskandar has been crowned “World’s Funniest Person” in 2016. Sit back, relax, and have a blast laughing out loud at the many comedy clubs and festivals in KL. Vivacious quartets, choirs and solos, traditional and modern dancing, as well as comedy plays are some of the performances that are always on stage at the Kuala Lumpur Performing Arts Centre (KLPAC). Local talents that were first born on this stage have now grown international showcasing the people of Malaysia and its culture. If you fancy a more classical black tie event, the Malaysia Philharmonic Orchestra (MPO) play host to some of the world’s acclaimed musicians such as Lorin Maazel, Sir Neville Marriner, Yehudi Menuhin, Joshua Bell, Harry Connick Jr., José Carreras, Andrea Bocelli and Branford Marsalis. Tucked away in the mountains of Sarawak, the Sarawak Cultural Village brings you back in time when cannibals used to hunt and kill their enemies with skulls fashioned as trophies. You’ll not want to miss the song and dance which are intoxicating and fun. And if you’re light on your feet, consider yourself challenged to a round at the Bamboo Dance! Easy enough to follow but be aware of toes nipping! Staying in a longhouse is recommended as authentic longhouses are still preserved as a testament to the true indigenous tribal life. Custom-plan your very own ideal travel experience! What better way to experience a country.